Delicious pick me up smoothie. Perfect as a breakfast or perfect as a pick me up "boost". Completely peel the bananas and slice them. If you have time freeze the banana for at least 1 – 2 hours in an airtight container. 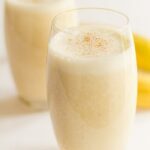 Place the banana, chosen milk, ground almonds and optional ingredients into a food processor or blender. Blitz the mixture until smooth.